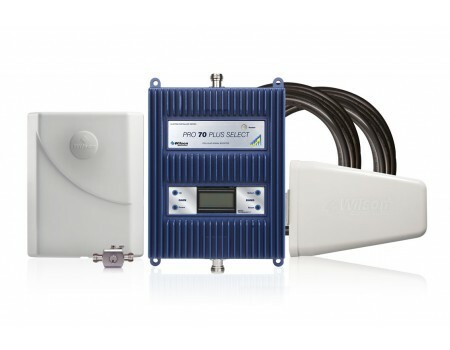 The Wilson 462127 Pro 70 Plus Select Signal Booster Kit is a commercial grade signal booster system from the Wilson Electronics Professional line of boosters. It will amplify the 2G, 3G and 4G LTE networks from all of the major carriers in North America and features the maximum downlink power permitted by the FCC, allowing it to cover up to 50,000 sq ft inside of a building with boosted signal with a strong existing outside signal. If there is a weak existing outside signal, then the coverage area will be smaller. 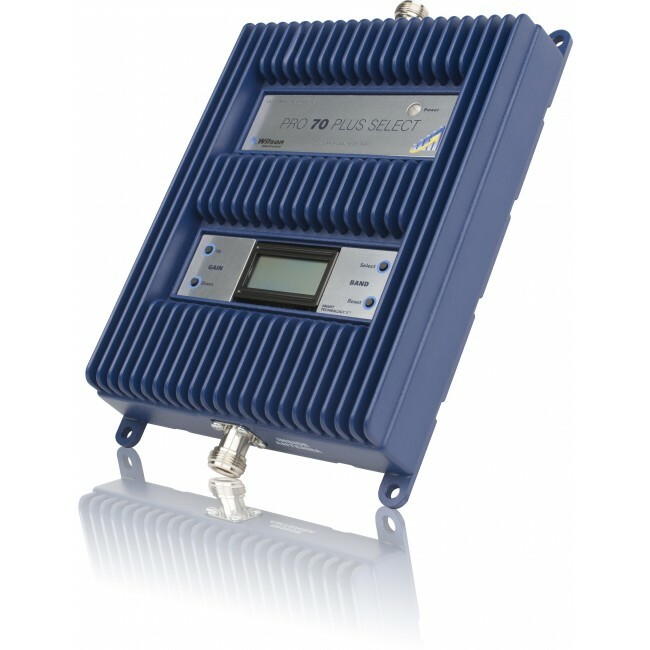 The most advanced gain control system on the market that combines an intelligent automatic gain control system that automatically adjusts the independent frequency bands to their optimal levels and the ability to manually override the AGC and adjust the uplink and downlink independently for each frequency band. The maximum downlink power permitted by the FCC. 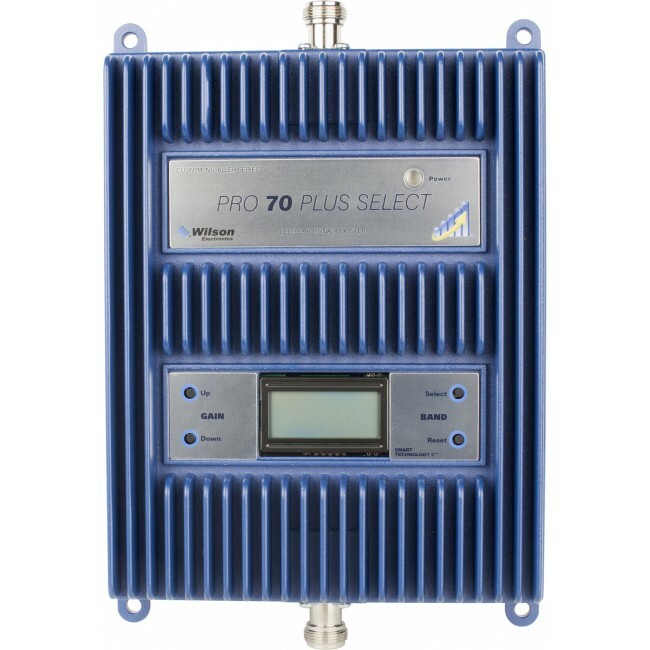 This allows the Wilson Pro 70 Plus Select to receive an outside signal up to 10 decibels stronger than any other amplifier on the market, which translates into a maximum coverage area of up to 50,000 sq ft.
All of the components that you need to start boosting signal, including the highest quality cables we offer and a bonus lightning protector kit for maximum amplifier protection. 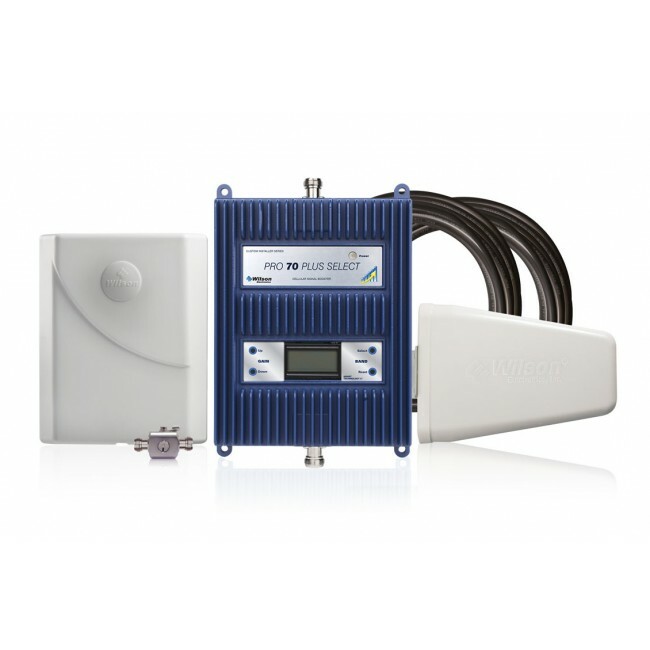 The total coverage area that any signal booster system can provide is directly related to the initial signal strength that the outside antenna is receiving from its location on the roof of the building. 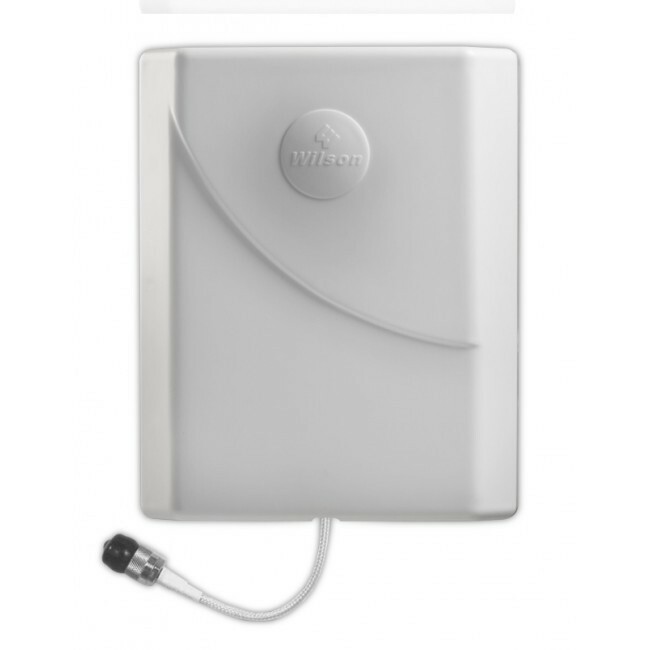 The stronger the outside signal, the more coverage you'll get from the system, especially in the case of the Wilson Pro 70 Plus Select Signal booster kit. It is also important to remember that there are many factors that go into determining the total coverage area, so actual results may vary from these estimates. If you require more coverage than you can get from a single Wilson Pro 70 Plus Select system, it is possible to use multiple kits within the same building. If you would like help designing a system for your larger building , please fill out our Custom Kit Request Form and we can help you design a custom solution. The Wilson 462127 Pro 70 Plus Select supports the 2G, 3G, and 4G LTE networks from virtually all carriers in the United States and Canada. For other locations, please consult the frequencies outlined below to see if this product will work for you. The Wilson 462127 Pro 70 Plus Select comes with everything that you need for immediate installation, however, there are a few of additional items you may want to consider. 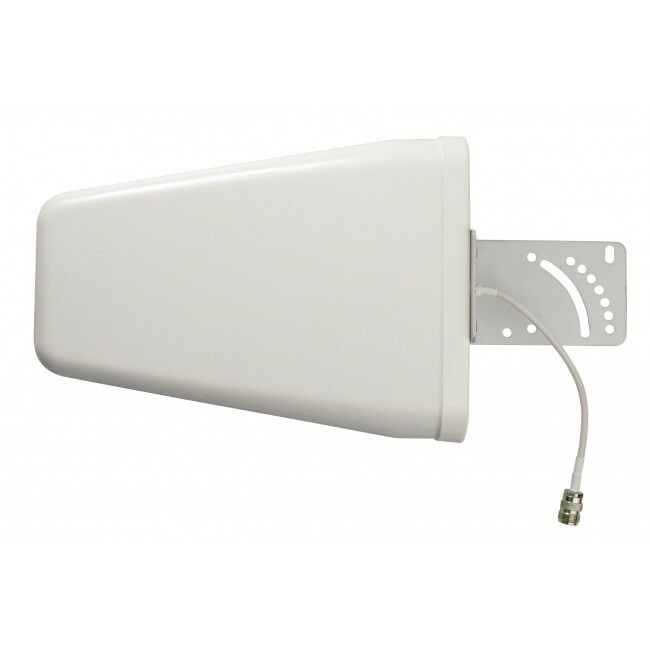 The included directional outside antenna is designed to be mounted to a pole that is 2 inches in diameter or less. If you do not have an existing tv antenna or other pole you plan to use, a Pole Mount Kit is a convenient and low cost option. It simply attaches to a flat vertical surface and provides a foot of vertical pole to attach the antenna and rotate into place. In some instances, you may need to add a second inside antenna to your installation, to account for irregular building shapes or internal walls that are obstructing the flow of signal. 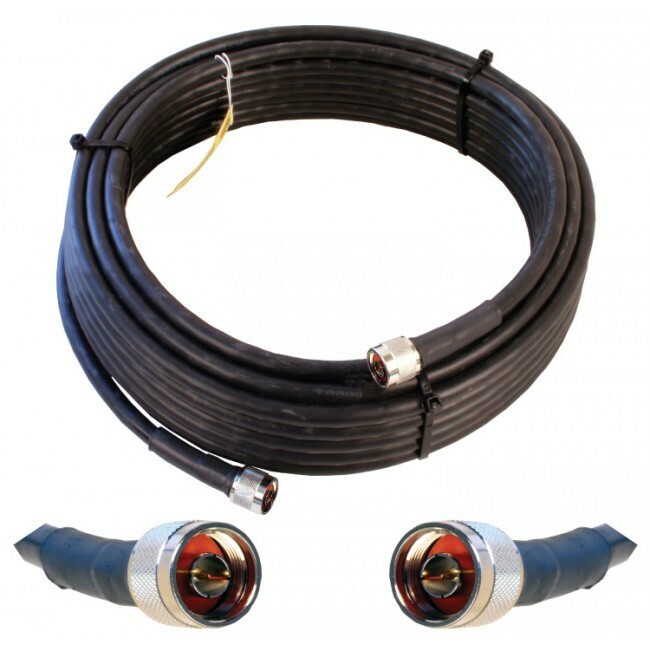 In that case, you can purchase the Add-On Inside Panel antenna Kit, which includes everything you need to add a second inside panel antenna to your installation. 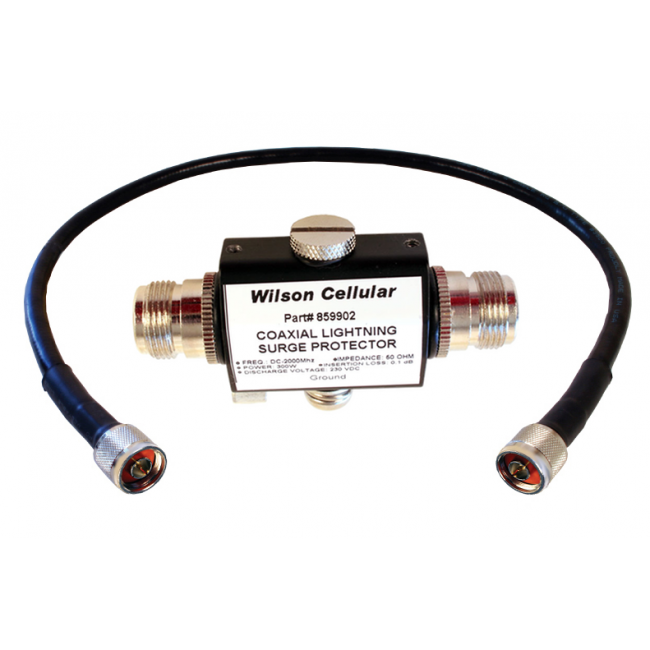 The Wilson 462127 Pro 70 Plus Select Signal Booster Kit is fairly straightforward to install, with the most challenging part being the cable runs with the ultra low loss cable, which may require drilling holes or routing through conduit. If you are not comfortable with performing the installation, then it is recommended to hire a general contractor, home audio/theater installer, electrician, or cable repair person to perform the installation for you. When initially performing the installation, you should avoid drilling any holes or permanently mounting any components until the system has been tested and is achieving a level of boosting. This allows you to troubleshoot any initial problems, including moving or adjusting components, without having to undo any installation work that has already been conducted. If you have any questions or need assistance at any point during the installation, please contact us for help. The first step in the installation process is to determine the side of the building that the external yagi antenna should be mounted on. This is done by putting your phone into field test mode and walking around the full perimeter of the roof, noting the signal strength in multiple locations. Once you've done a walk around, the location where you were getting the best initial signal (the lowest decibel number) is going to be the location or side where you should mount the external antenna. The yagi directional antenna is designed to be mounted to a vertical pole, so now that you've determined the location where the antenna should be mounted, the next step is to either leverage an existing pole, or install a new pole using the Pole Mount Assembly. Once the pole is installed, mount the yagi antenna to it using the included antenna mounting equipment, and aim the antenna away from the building. Connect the 75 ft cable to the antenna and then run to the location inside of the building where you plan to mount the amplifier. With the cable now at the location where you plan to mount the amplifier, attach the lightning surge protector and then the 2 ft cable. Mount the amplifier and then attach the other end of the 2 ft cable to the "outside antenna" port of the amplifier. Connect the 60 ft cable to the "inside antenna" port of the amplifier and run to the location where you plan to mount the internal panel antenna. The internal panel antenna should ideally be mounted to the ceiling facing downwards in the center of the space that needs coverage. If the building is a home with an attic, then alternatively the panel antenna can be placed face down on the floor of the attic, in the center of the house, and will broadcoast boosted signal throughout the area below. Once the panel antenna is mounted, then connect to the 60 ft cable. Once the system is in place, power on the amplifier and wait for the amplifier to go through its initiation sequence of blinking lights. Now that the amplifier is powered up, you'll have to cycle through all of the bands and check that the power light remains green. If it changes to either orange (overload) or red (oscillation), then that indicates a problem on that band and needs to be fixed. Consult the manual for more information or contact us for help. Finally, the last step in the installation process is to aim the yagi directional antenna that's on the roof. The manual outlines the steps for that, or you can consult our complete guide on how to aim a yagi directional antenna. Once you've aimed the antenna, cycle through the bands on the amplifier one more time to confirm that you have all green lights, and then you've successfully completed the installation.